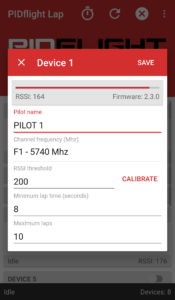 The PIDflight Lap firmware is available for the original PIDflight Lap schematic, EasyRaceLapTimer PocketEdition and Chorus RF Lap Timer. Please use this firmware if you are using an EasyRaceLapTimer PocketEdition or a PCB based on the same schematic. Bluetooth software serial on D6 (RX) and D7 (TX) pins using baud rate 9600. Firmware ERLT 2.2.0 2.2.0 Stable Recommended Multi-pilot support for dedicated lap timers. 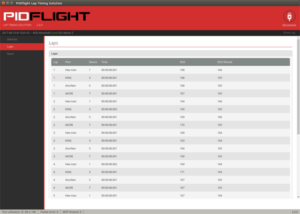 Firmware ERLT 2.5.0 2.5.0 Experimental Multi-pilot support for dedicated and virtual lap timers. Firmware ERLT 2.6.0 2.6.0 Experimental Multi-pilot support with signal strength peak detection. Firmware ERLT 2.7.0 2.7.0 Experimental Multi-pilot support for dedicated and virtual lap timers with signal strength peak detection. Please use this firmware if you have a build based on the Chorus RF Lap Timer schematic. Bluetooth hardware serial on RX and TX using baud rate 115200. 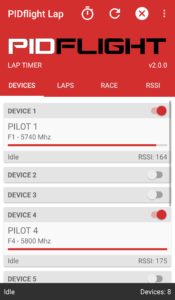 Firmware CHRF 2.2.0 2.2.0 Stable Recommended Multi-pilot support for dedicated lap timers. 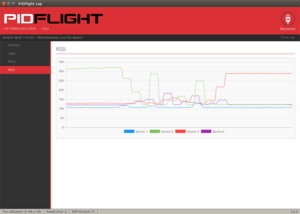 Firmware CHRF 2.5.0 2.5.0 Experimental Multi-pilot support for dedicated and virtual lap timers. Firmware CHRF 2.6.0 2.6.0 Experimental Multi-pilot support with signal strength peak detection. 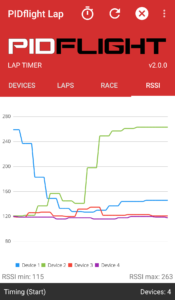 Firmware CHRF 2.7.0 2.7.0 Experimental Multi-pilot support for dedicated and virtual lap timers with signal strength peak detection. Archived firmware that is no longer supported. 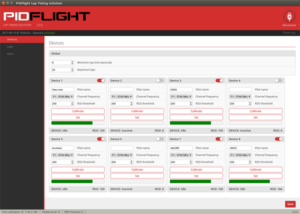 PIDflight Lap Firmware 1.2.0 1.2.0 Deprecated No longer supported, please upgrade to 2.x.x. EasyRaceLapTimer PocketEdition Firmware ERLT 1.2.0 1.2.0 Deprecated No longer supported, please upgrade to 2.x.x. 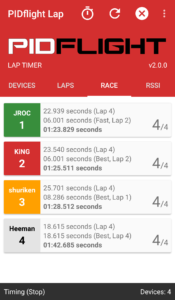 Release candidate version: 2.0.6-RC3 with Tiny View Plus support, race countdown and device status indicators on race screen. 21/4/2018 — There are known issues in 2.0.6 with the race countdown function on Windows and potentially macOS. A resolution is in progress and a new update will be published soon. 30/4/2018 — Race countdown issues have been addressed in 2.0.6-RC3.